"Erica Wright, known professionally as Erykah Badu, is an American singer-songwriter, record producer, disc jockey, activist, and actress. Badu's career began after opening a show for D'Angelo in 1994 in Fort Worth; record label executive Kedar Massenburg was highly impressed with her performance and signed her to Kedar Entertainment. Her first album, Baduizm, was released on February 11, 1997. It spawned three singles: "On & On", "Next Lifetime" and "Otherside of the Game". The album was certified triple Platinum by the Recording Industry Association of America (RIAA). Badu's first live album, Live, was released on November 18, 1997 and was certified double Platinum by the RIAA. Badu is hailed as the queen of neo soul. Badu's second studio album, Mama's Gun, was released on October 31, 2000. It spawned three singles: "Bag Lady", which became her first top 10 single on the Billboard Hot 100 peaking at #6, "Didn't Cha Know?" and "Cleva". The album was certified Platinum by the RIAA. Badu's third album, Worldwide Underground, was released on September 16, 2003. It generated three singles: "Love of My Life (An Ode to Hip-Hop)", "Danger" and "Back in the Day (Puff)" with 'Love' becoming her second song to reach the top 10 of the Billboard Hot 100, peaking at #9. The album was certified Gold by the RIAA. 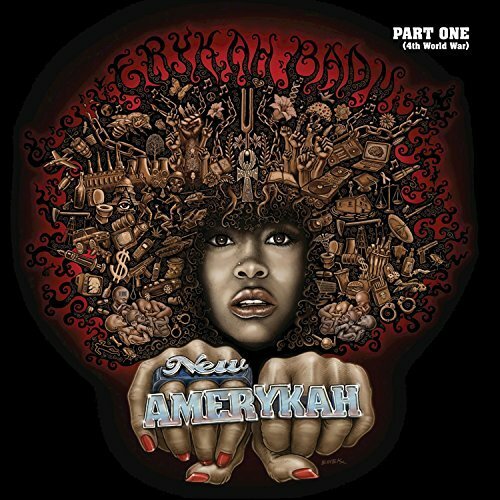 Badu's fourth album, New Amerykah Part One, was released on February 26, 2008. It spawned two singles: "Honey" and "Soldier". New Amerykah Part Two was released in 2010 and fared well both critically and commercially. It contained the album's lead single "Window Seat", which led to controversy. Badu has also ventured into acting. She made her debut as a supporting role in the 1998 film Blues Brothers 2000, playing Queen Mousette. The film gained mostly mixed to negative reviews from film critics and was considered a commercial failure. Badu made her second appearances in The Cider House Rules (1999), where she played the character of Rose Rose. The film fared well both critically and commercially, with Badu receiving numerous awards and nominations including a win at the 2000 Black Reel Awards for best supporting actress as well as nominations for Screen Actors Guild Awards and Satellite Awards. In 2004 Badu returned to the screen playing Lady/Bernadette in House of D. Badu also had small roles in Before the Music Dies (2005), and Dave Chappelle's Block Party (2006). She is reported to have a leading role alongside Mos Def in the upcoming indie film, Bobby Zero, which tells a story of a struggling couple, who hit rock bottom after Mos Def's character gives up his artistic dream to pursue an advertising corporate job to live on. She also appeared in scenes of the music video of Miko Marks' 2006 recording "Mama" and Common's video for "The Light," as well as making a special appearance on the sitcom Girlfriends. In 2008 Badu became the face of fashion designer Tom Ford White Patchouli fragrance. Ford, longtime friends with Badu, considered her the best choice for the campaign. "I have always considered her a true beauty ... she just fits", says Ford. In late December 2013, it was announced that Badu would become the face of Givenchy's 2014 Spring collection. Badu made her New York Fashion Week debut alongside designer Kerby Jean-Raymond in 2016, styling for his Pyer Moss collection titled "Double Bind." Erykah Badu and Kerby Jean-Raymond titled this collection after Gregory Bateson's idea Double bind. Badu called this collection a "movement" against issues including depression, racism, and hatred. Badu also remains an activist in her hometown of South Dallas. In Nation19 Magazine Badu talked about why she set up her own charity organization, titled Beautiful Love Incorporated Non Profit Development (B.L.I.N.D. 501c3). The charity was established in 1997 and aims to provide "community-driven development for inner-city youth" through the use of music, dance, theater and visual arts… As an outreach for B.L.I.N.D., Erykah traveled to Africa in February 2003, where she worked with children affected by AIDS and poverty. Erykah has also received the Key to the City of Dallas and been recognized in Philanthropy Magazine for her efforts in community service. In 1997, Badu received six nominations and won three, Favorite Female Solo Single for "On & On", Favorite Female Solo Album for Baduizm and Best R&B/Soul or Rap Song of the Year for "On & On" at the Soul Train Lady of Soul Awards. In 1998, Badu received fourteen nominations and won eight, including Favorite R&B/Soul or Rap New Artist at the American Music Awards; Best Female R&B Vocal Performance for "On & On" and Best R&B Album for Baduizm at the Grammy Awards; Outstanding New Artist and Outstanding Female Artist at the NAACP Image Awards; Favorite Female Soul/R&B Single for "On & On", Favorite Female Soul/R&B Album for Baduizm and Favorite New R&B/Soul or Rap New Artist for "On & On" at the Soul Train Music Awards.